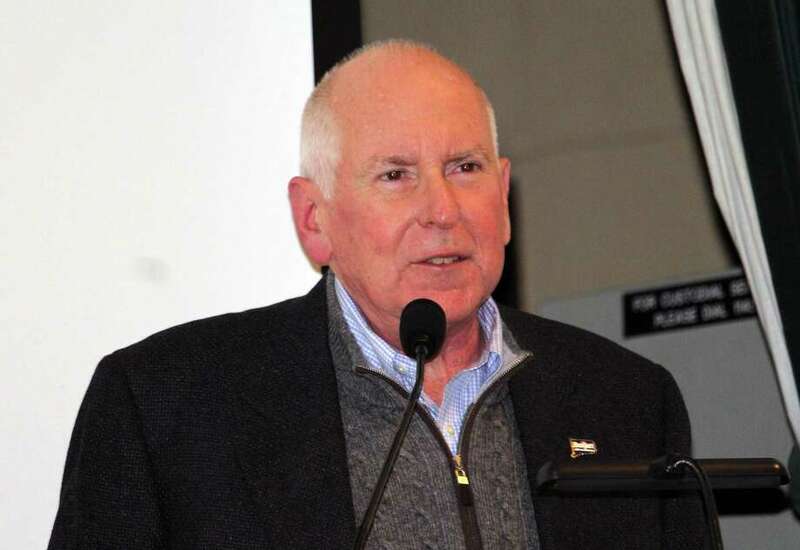 First Selectman Jim Marpe delivers the State of the Town address at Westport Town Hall Jan. 28. WESTPORT — Town officials on Sunday lauded past efforts to improve Westport, but also admitted there is work still to be done. First Selectman Jim Marpe and Board of Education Chairman Michael Gordon addressed a packed house in the Westport Town Hall auditorium for the annual State of the Town address. Marpe and Gordon applauded Westport’s continued strong fiscal standing in the face of uncertainty in Hartford. Marpe noted Westport’s extensive cultural offerings, economic vitality and quality of life. Gordon highlighted the district’s high state and national rankings, the strength of its special education program, and the abilities of school Superintendent Colleen Palmer, who took over in the 2016-17 school year. “We truly believe we have hired one of the best superintendents in the country,” Gordon said. But both men stated a growing need to remain financially strong and a desire to form a better partnership with increased efficiencies between the town and the school. Marpe also noted the town has traffic issues along some stretches of the Post Road, adding the town is working to resolve issues at the intersection near the former Daybreak Nursery. As for the two large water tanks Aquarion has proposed on North Avenue, to significant backlash from neighbors, Marpe said the town was working closely with the water provider to better understand the specifics of its proposal. Working toward improving the schools, Gordon said the district is looking closely at emotional-intelligence training for staff and students, ensuring smoother transitions between fifth and sixth grades and eightth and ninth grades and creating a healthy learning environment. A question was asked about the school district’s sexual assault policy after a group of students publicly criticized the reactions of administrators to whom they reported a classmate they said acted inappropriately in an off-campus setting. Palmer stepped in to help answer the question.